If you are struggling to get to the dojang this holiday season or your life just seems to busy to get in and training just seems to hard or too much of a task, you can use the tips below to help you get back into the swing of things. Tang Soo Do training improves your mood! Ever notice how you feel great after a Tang Soo Do class? Tang Soo Do training or for that matter any physical activity such as strength training releases various chemicals and endorphins that make you feel better. This goes hand in hand with the increase in confidence that you get from knowing that you are learning and training in techniques that may in fact help to safe your life! 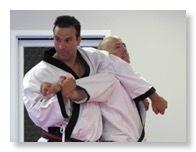 Tang Soo Do trains you to defend your self! This is obvious, but sometimes we need to be reminded of how important this is! All you need to do is watch the news and see how important this is especially today. Tang Soo Do helps you to control your weight! Martial Arts training burns a tremendous amount of calories. Not only during your training session but for many hours afterwards. The more intense you make your training the more calories you’ll burn! Vigorous and regular physical activity such as Martial Arts training, boosts HDL (high-density lipoprotein) or "good," cholesterol and decreases unhealthy triglycerides. This helps keep your body running smoothly which can decrease your risk of cardiovascular diseases. In fact, regular physical activity can help you prevent or manage a wide range of health problems and concerns, including stroke, metabolic syndrome, type 2 diabetes, depression, certain types of cancers. Make your training a priority! Plan out your week and mark two days that you will get to to the school and don’t let unexpected things stop you. It’s easy let something that comes up during the week provide an excuse for you. Use technology and set up reminders on your smart phone to help motivate you. Also, we’ve included in our weekly schedule 1/2 hour belt specific training sessions on Wednesday to provide a quick training session on belt specific requirements. Get in and train for a half hour if needed! Change your perspective and visualize! Start to look at yourself as a Martial Artist! View yourself as Martial Artist! Don’t see yourself sitting on the couch watching TV and eating poorly. Grandmaster Andy Ah Po taught visualization as one of his key components to being an effective martial artist. Visualize yourself executing prefect Tang Soo Do techniques. See yourself getting to the dodging and training and working out. Set a goal for yourself! Pick on or two techniques that you want to learn or prefect and get in and work on them. Watch our senior Ko Dan Ja and You Dan Ja perform! Pick a new hyung (form) that you want to learn and start to work on it. Our Tang Soo Do curriculum is rich with many different forms to pick from and set a goal for yourself to become a ‘school resource’ on that particular form. Switch things up! We offer so much here at South Hills Karate Academy. Pop in to Lori’s yoga class. It will help improve your flexibility! Come in and train in Tai Chi Naibu which will help to increase your Chi or ‘life energy’. Still not enough? We can help you get into strength training in the MartialFit gym which can help you improve your strength and speed as well as weight loss. Use technology. Pick up a fitness band to record your calories that you burn during class times! These are a good source of motivation. new techniques or a new form. Concluding, find ways to build Tang Soo Do into your life. After all Tang Soo Do is a way of life. Start to think of yourself as a Martial Artist and not just look at Tang Soo Do training as something to do or just a recreational activity. Mark your training sessions on your calendar and use technology to help you stay motivated and make your training fun. Use Tang Soo Do to set yourself up for a lifetime of better health, more happiness, and more energy for everything else in your personal life!